RATON – A large black bear broke into a home north of Cimarron and attacked an elderly, bedridden woman Tuesday night. 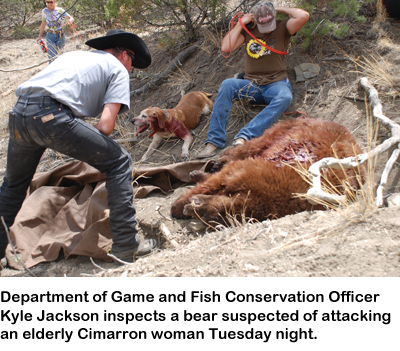 A bear believed to have been the attacker was caught and killed by Game and Fish officers today. The woman received minor injuries. The 82-year-old woman, who asked to not be identified, was in bed with the doors and windows open when a bear broke the latch on a screen door and entered her room. The housekeeper went in about 10 p.m. to close the doors and turn off her light and found her with scratches on her nose and head. The housekeeper applied first aid but didn’t find it necessary to call for further medical assistance. Game and Fish officers were called the next morning when it was apparent that a bear had broken the screen door. Conservation Officer Kyle Jackson contacted Hap Blacksten, a local houndman, who was able to find the bear with dogs. The bear was killed and taken to the Veterinarian Diagnostic Center in Albuquerque, where it will be tested for rabies. Normally, food smells entice bears into camps or homes, but there was no food in the bedroom. The housekeeper said she didn’t hear a sound and there also was a dog in the house that didn’t alert to the bear. Anyone who lives in bear country should make sure that their doors and windows are locked. Windows and doors left open for ventilation are easy entryways to bears and other wildlife looking for food. For information about bears and other New Mexico wildlife, please contact the Game and Fish at (888) 248-6866, or find us online at www.wildlife.state.nm.us.